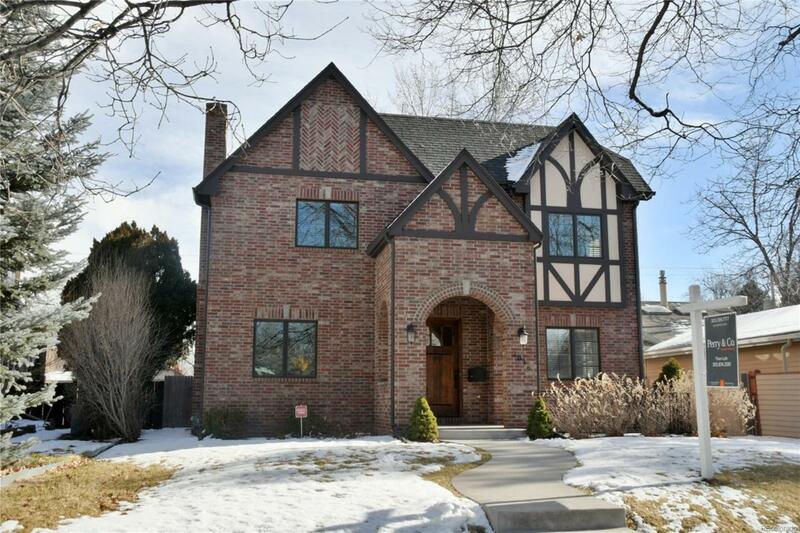 Located in the heart of Park Hill, on a quiet, lovely block, this spectacular custom brick Tudor home will not disappoint. Thoughtfully constructed in 2013 on a double lot, with a welcoming front porch and large yard with mature trees. Highest levels of finish & design, a kitchen with large island, Thermador gas range & hood, formal dining w/ crown molding & wainscoting, butlers pantry, office/study with gas fireplace, mudroom with abundant built-ins, shelves & cabinets, breezeway to 2 car garage. 2nd floor features enormous master suite with walk in closet, marble floor & countertops, soaking tub & abundant windows catching the morning sun; laundry room; and two additional bedrooms and large bath. Basement with 9 ceilings, large family room and two bedrooms with egress windows. Close to all that Park Hill has to offer Denver Zoo, Museum of Nature & Science, shops/restaurants on Kearney & 23rd/Dexter Streets.